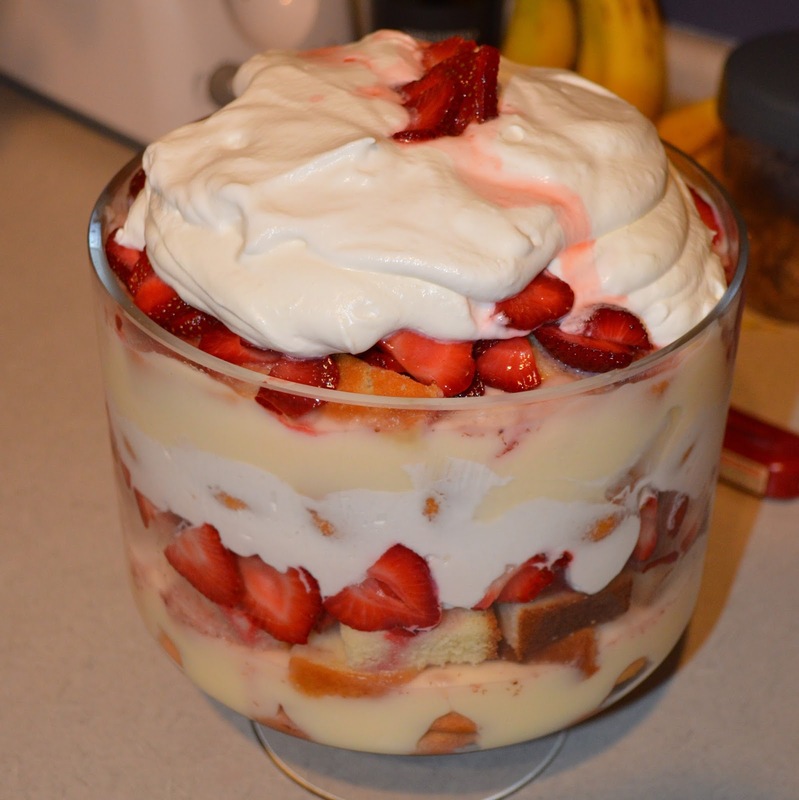 I'm going to start out with saying that there are about a thousand different ways that you can make a trifle - and would bet that about 90% of them are delicious!!! This one absolutely falls in that 90%. No one component in this is hard to make or difficult to put together - so the ease that this dessert can be whipped together will give the perspective that you slaved at putting together an extravagant dessert, when really you layered a few easy ingredients. I think that the best thing about this dessert is that we got to purchase a trifle dish to have the right presentation on this dish. With how much I have cooked and grilled and made desserts and baked - I didn't have a trifle dish. Now that I think about it, there are a few misc kitchen items I don't have - like a bundt pan or a punch bowl. I'm sure some day I'll find a recipe that I want to try which requires one of those items. What I haven't mentioned is that this was our Easter dessert and it would have been scored 5 out of 5 stars by every guest. There was barely any left and happy comments flowed from the first bite on...adults and kids alike - this was a crowd favorite! Strawberry Prep - Rinse, de-stem and slice strawberries. Place in a bowl with 1/2 cup sugar and stir coating all of the strawberries. Cover with saran wrap and chill in fridge for 3+ hours. This will give you lots of strawberry juice that will soak in the wafers and short bread. Custard Prep - whip pudding and whole milk per package instructions. Place in fridge for 10-30 minutes to help set. Homemade Whip Cream - combine heavy whipping cream and powdered sugar and vanilla in another bowl and whisk until you achieve solid peaks. Constructing the Trifle - Layer the following (try to get 3 layers, but if not, 2 will do): Nilla wafers, custard, short bread, strawberries (don't forget some of the juice), whipped cream; and repeat.